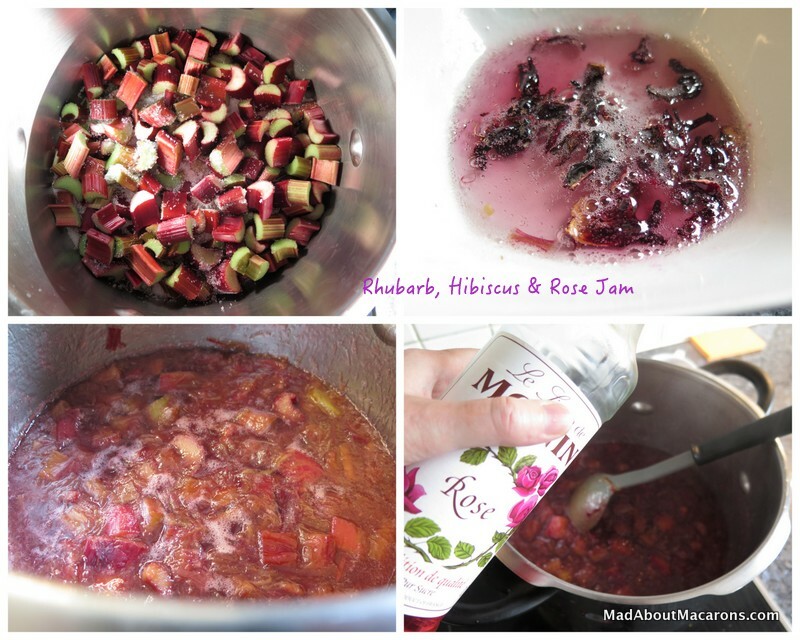 Rhubarb Hibiscus Rose Jam sounds quite a mouthful, doesn’t it? Believe me, when you try a spoon of this – it’s worth the long title and the recipe is just so easy! Last year I found a solution to our not-so-pretty green rhubarb found at our local French markets. I didn’t want to add strawberries to give it a pink look; instead I wanted JUST the rhubarb. 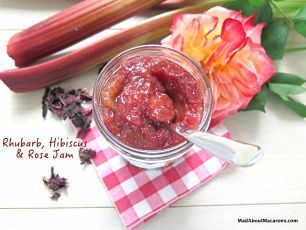 So I experimented with the addition of hibiscus and red fruit tea to this Rhubarb and Ginger Compote recipe. Bingo! It worked. You’ll also love this gadget I talked about last jam-making season. Terraillon were kind to let me try their new jam-making scales just at the end of the plum season and I was so impressed (read my detailed review here). You know how you can never predict if you have 1 kg of fruit and end up with a funny number like 243g or something? Well, you can set the scales to x amount of sugar per kilo of fruit. So here, I had just enough for one pot this morning and didn’t even need to do any maths! 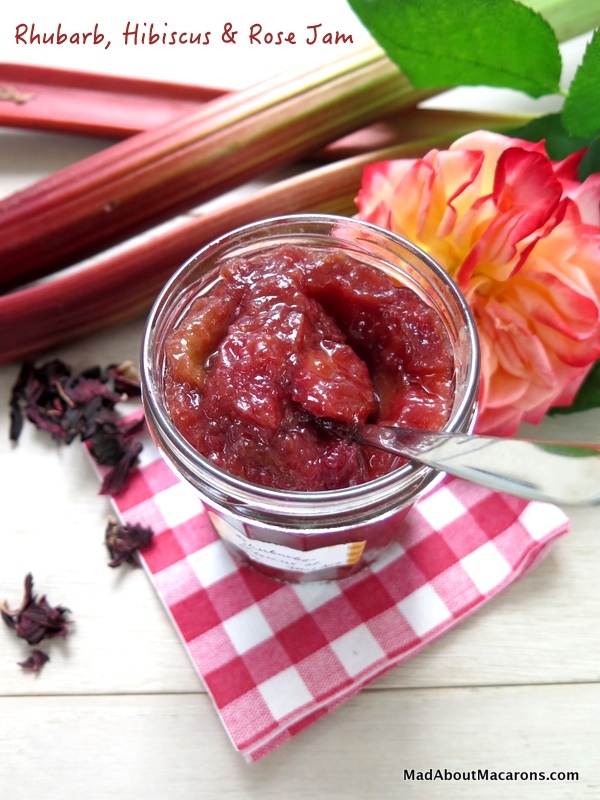 Pectin or No Pectin for Rhubarb Jam? I normally use a pectin sugar since, like strawberries, it needs that bit of pectin in order for it to set more easily. If you don’t have pectin sugar, you can still make it with normal granulated sugar but bubble it up slightly longer for it to thicken. Sterilise 3-4 jam jars to ensure they are spotlessly clean. I normally just clean them in the dishwasher but if you prefer, leave them to soak in boiling water for a few minutes and set aside to dry on a clean kitchen towel. Wash, trim off the end stems (ensure there are no trace of the rhubarb leaves as these are toxic) and cut the rhubarb into slices. Measure the rhubarb in a large bowl and add the sugar. Cover the bowl and leave the rhubarb to macerate in the sugar overnight or for a few hours, until the sugar turns liquid. Sieve out the liquid into a thick-bottomed pan. Reserve a small amount of liquid into a bowl and add the hibiscus flowers or teabag to infuse. Place this in the microwave or in a small saucepan to heat gently until the hibiscus has infused, leaving the liquid a pretty dark pink. Return the pink liquid to the big pan. Throw in the rhubarb and heat on high for 20-25 minutes or until thick. Add the rose syrup after 10 minutes. When thick enough, spoon the jam into the jars, and close the lids. Store in a cool, dry place and consume within the year. Absolutely delicious spooned on fresh brioche. Or why not fill deep pink macaron shells with it? NUTRITIONAL INFORMATION: 250 Calories per 1/4 of a pot. What an idyllic childhood with garden rhubarb, Liz. Hope you try this, even if it’s not that green since the taste is delicious. Hi Lainie, how lucky that you grow rhubarb! The sugar is enough to preserve the fruit and I’ve never done a water bath after. As long as your jars are sterilised, then that’s enough. Enjoy the recipe.